Because it's worthy of a standing ovation, Steve Wynn's newest resort-casino, Encore, is aptly named. You'll know it when you see what's inside. Look up, for instance, and you'll see gorgeous red Rubino chandeliers hanging over the casino floor, a visual encore to your gaming experience. The 126,000 pieces of Italian glass used in these 66 chandeliers begin clear and gain their vibant red color after being heated to two temperatures with 24k gold. The glass represents the largest order of Rubino glass in more than 1,000 years of Murano history. Although they're easily among the most breathtaking sights at Encore, they're just as easily outshined by another spectacular feature. As you enter the casino from the high- end shopping Esplanade that separates Encore from Wynn, you’ll see it: A mesmerizing 27-foot crystal dragon that watches over Wazuzu, Encore's new pan-Asian bistro. Overlooking the casino, this casual bistro is pure Asian, featuring delicate flavors from several regions, each standing on its own. "Fusion" is a word that's forbidden here! At the helm is Chef Jet Tila, who oversees the restaurant's Southeast Asian cuisine, including dishes from Thailand, Vietnam, China, Korea and Japan. Chef Tila's name should sound familiar; among his many accolades, he held until 2007 the world record in the Guinness Book of World Records for having made the world’s largest stir-fry, weighing in at 1,805 lbs. in 2005! 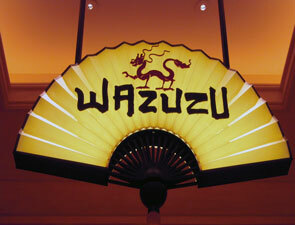 While the flavors are big and bold at Wazuzu, you needn’t eat 1,800 lbs. of stir-fry to sample its cuisine. For smaller yet no less delicate creations, look to Sushi Chef Masaru Matsuura, who prepares traditional and not so traditional sushi throughout the day. And while you're at it, try a specialty cocktail from Wynn’s in-house mixologist, Patricia Richards. They pair perfectly with one of Chef Tila’s nine special sake selections. 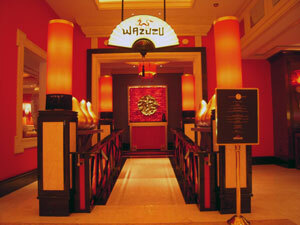 For a date night, or just a fun night out, Wazuzu offers a unique Asian dining experience you won’t easily forget.